When I first saw this recipe on Annie’s Eats blog, I knew it would be perfect for a summer party and really, who doesn’t love Oreos and Rice Krispie treats?!?! I adapted the recipe slightly from the original one, but it came out perfectly! Melt bittersweet chocolate in a small microwave safe bowl. Microwave for 30 second intervals stirring in between until completely melted. Set aside. Grease a 9×13″ pan. Melt the butter in a large saucepan over medium heat. Add the marshmallows and stir until melted and well combined. Turn off the heat and stir in the melted chocolate and vanilla. 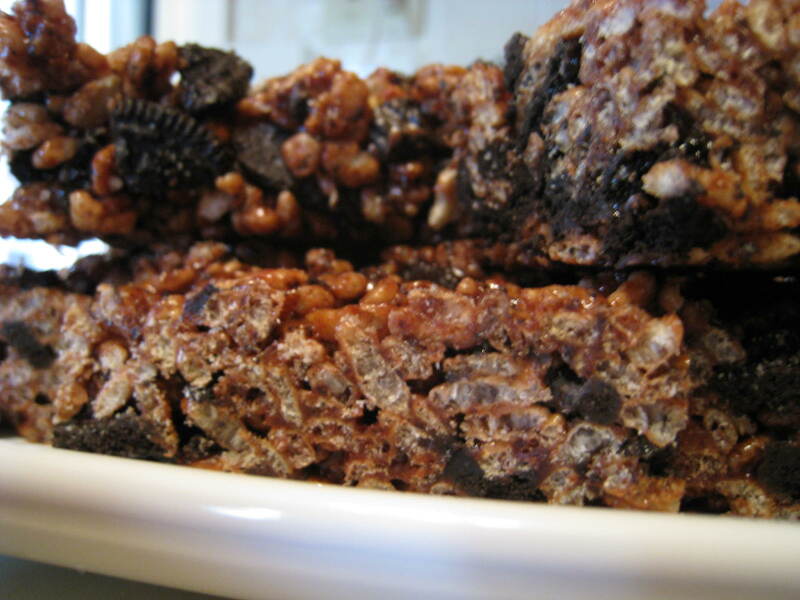 Gently stir in the rice krispies and coarsely chopped Oreos and mix to coat evenly. Press the mixture into the prepared pan, leveling the top. Allow to cool completely and cut into bars. Store in an airtight container.